Democratic representative of New York City, New York, Charles Bernard Rangel, first elected to the U.S. House of Representatives in 1970 and retiring in 2017, served 46 years in Congress. Rangel was born in Brooklyn, New York City in 1930 to Blanche Mary Wharton and Ralph Rangel. He attended De Witt Clinton High School but dropped out in 1948 and entered the U.S. Army. He served in the all-black 503rd Field Artillery Battalion, Second Infantry Division in Korea in the early 1950s where he earned a Purple Heart, a Bronze Star, a Presidential Unit Citation, the Republic of Korea Presidential Unit Citation, and three battle stars for his actions in combat. Rangel received an Honorable Discharge in 1952, and returned to New York. He earned his GED in 1953, a B.S. degree from New York University School of Commerce in 1957 and a J.D degree from St. Johns University in 1960. Upon admittance to the bar Rangel began practicing law in New York City. In 1964, Rangel served as assistant U.S. attorney for the south district of New York working under U.S. Attorney Robert Morgenthau. He also married the former Alma Carter and the couple later had two children, Steven and Alicia. In 1965 Rangel was counsel to the Speaker of the New York State Assembly. Throughout the late 1960s Rangel was legal adviser to many civil rights activists in New York and the South. Rangel was elected to the New York State Assembly, representing the 72nd District (Central Harlem), in 1966. In 1970 he entered the Democratic primary where he narrowly defeated legendary Congressman Adam Clayton Powell. In November he was elected to represent New York’s 15th District in Congress over token Republican opposition. 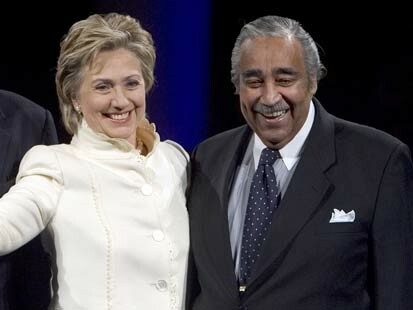 A co-founder of the Congressional Black Caucus in 1971, Rangel was elected chair of the group. He also served in the House Judiciary Committee’s hearings on the impeachment of President Richard Nixon. In 1983, Rangel became chairman of the Select Committee on Narcotics Abuse and Control and was appointed a Deputy Whip for the House Democratic leadership. He remained in the position until 1993. Rangel was arrested numerous times for protesting human rights violations particularly in South Africa but was never charged. Rangel became the first African American Chair of the House Ways and Means Committee in January 2007. The following year, however, he faced numerous ethics allegations and was censured by his peers for ethics violations in 2010. Having spent forty-six years on Capitol Hill, Rangel retired after his term expired in January of 2017 and was succeeded by Adriano Espaillat. Rangel has received Honorary Degrees from Hofstra University (1989), Syracuse University (2001), Suffolk University Law School (2002), and Bard College (2008). He was given the Jackie Robinson Foundation’s Lifetime Achievement Award in 2005. In 2006, Rangel was the recipient of the Distinguished Service Award from the Washington International Trade Association and received a Presidential Medal from Baruch College. He is a member of Alpha Phi Alpha Fraternity. Bruce A. Ragsdale and Joel D. Treese, Black Americans in Congress, 1870-1989 (Washington, D.C.; U.S. Government Printing Office, 1990); https://www.timeout.com/newyork/things-to-do/charles-rangel; Matt Vespa, “NY Congressman Charlie Rangel, Who was censured for not paying taxes, set to retire”, Townhall.com, (February 25, 2016), https://townhall.com/tipsheet/mattvespa/2016/02/25/ny-congressman-charlie-rangel-who-was-censured-for-not-paying-some-taxes-set-to-retire-n2124531; Charles Rangel and Leon Wynter, And I Haven’t Had a Bad Day Since (New York: St. Martin’s Press, 2007).